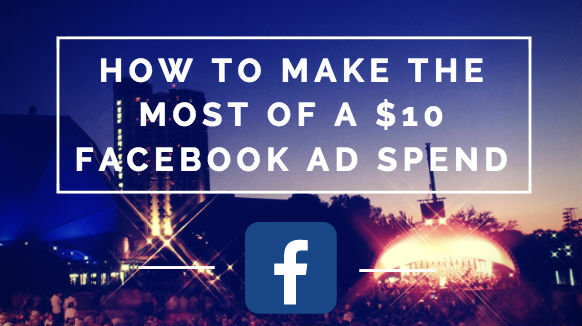 A great article at JeffBullas.com recently offered 10 excellent reasons to spend $10 a week on Facebook advertising. The piece, written by Jason Parks, made a strong case for investing cash into your content marketing strategy on Facebook. But, there are a couple of ways to make that $10 work even harder. Why not make $10 net a much heftier payoff? The theory is simple: Boosting posts is a good thing. Boosting posts that have been crafted to appeal to a target audience, based on data-driven research into their preferences, is a great thing. The death of organic reach on Facebook has been widely chronicled, and ad spends, as Jason explains, are one cost-effective way to get posts in front of the correct eyeballs (and their friends’ eyeballs). So in the land of super-viral worldwide information snowballs, it’s an easy choice to spend money to lob digital snowballs into newsfeeds. That’s $10 thinking. Now it’s time to go beyond $10 thinking. To multiply the impact of your ad spend, you need to lob posts that land with such poise and panache that people pick them up, ponder them, and pass them on. Researching the content that appeals to your audience can take a lot of time and money, you can shortcut the process with BuzzSumo’s top content search feature. It allows you to quickly and easily identify the most relevant topics, the most popular formats, and the most viral headlines. Developing content which you know appeals to your audience improves you content marketing odds. Hannah Smith, from Distilled, summed up this strategy for finding relevant topics. “BuzzSumo makes finding out what resonates with people ridiculously easy. Simply search for a topic and see what’s being shared. From there you can see the sorts of pieces and stories that are resonating, and identify themes. You can take this strategy even further than honing a list of topics to write about. The same tactic can identify the type of content your audience likes to see — videos or infographics, lists or how-to posts. Once you know what your fans like, you can serve up a steady stream of those types of things. Then, watch the statistics to see which is really their favorite. You will be ranking a list of four or five content types instead of a list of 50. Writing a killer headline, as recommended in this post at Kissmetrics is an essential part of getting your content read. You can nap tips to beef up your headline skills in the Kissmetrics article, as well as in this one at Wordstream. With a quick topic search at BuzzSumo, you’ll have a list of the most shared headlines ready to go. No need to reinvent the wheel. Check out the list of most shared quizzes from BuzzFeed below. You can see how they used an effective headline over and over to grab more shares. This type of content creation makes everyone happy. Your fans are happy because they have what they want—content they like. You are happy because you have what you want— solid information about your audience and a chance to grow your fan base by expanding your newsfeed real estate. Win! Approaching content creation haphazardly is costly in terms of time and money. It takes time to think of topics, time to write blog posts, time to find images. It just doesn’t make sense to spend the time writing something with one hand while the fingers of the other are crossed, hoping you have discovered a winning formula. It’s not a very effective way to create. Another approach is labor intensive. You can crawl the web for content, pulling shares with API’s. Crawling and pulling might be effective, but its hard, even tedious. And, it’s definitely not the most efficient choice when there’s an easier, quicker option. A top content search feature automates the process, essentially doing the crawling and pulling for you. In a few seconds our topic search will show you what people like to share. With a couple more clicks, you can create a really great list of proven ideas. Then you can analyze those ideas — look for the formulas that have the widest appeal, the themes that resonate, the headlines that grab attention.